Kansas Concealed Carry Signs are a requirement for any building that seeks to ban or restrict guns from their premises. According to the new concealed and open carry laws passed by the Kansas Attorney General's office, there is a variety of signage you can post depending on the facility. 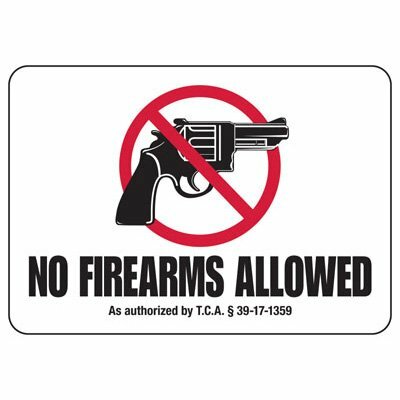 Complete banning of firearms would require you to post one of two signs depending on the status of your building. Banning concealed carry but allowing open carry and vice versa also have appropriate signs. Take a lot of the guess work out of picking the appropriate sign by browsing our offering of compliant Kansas Concealed Carry Signs and finding the right one for your purposes. Selecting Kansas Concealed Carry Signs can be confusing. The Kansas gun laws passed by the Attorney General's office have very specific rules on what signs to post based on what type of gun carrying you wish to prohibit in your facility. Thankfully, we carry a variety of signs based on the requirements set in the law. All that's needed is for you to purchase the sign and properly mount it on the entrance of your building. Ensure that there are no obstructions from viewing the signage and that it is visible from the exterior of the building. In addition, it should be at an adult's eye level so that's somewhere between 4 and 6 feet. Of course, there are additional specifics based on each type of sign so we advise you to read the guidelines passed by the Attorney General's Office. That said, check out our signs and find the right one for your facility and remain secure in the knowledge that our signs have been designed to be compliant with all the guidelines set for it.